A regional publisher has celebrated 100 issues of its pro-European Union newspaper which was launched in the wake of the Brexit vote. 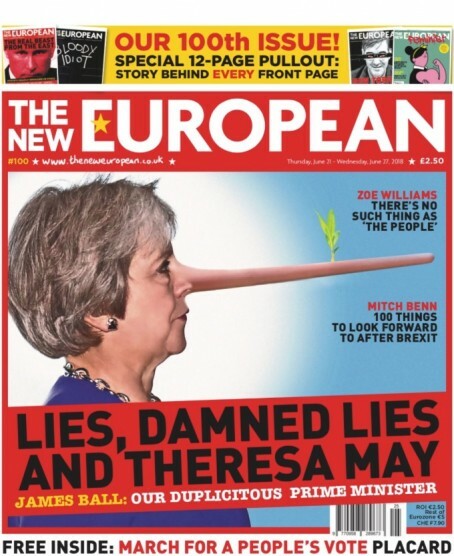 Archant weekly The New European was first published in July 2016, just nine days after the idea was conceived by chief content officer Matt Kelly. At the time, the Norfolk-based publisher said it would initially run for four issues, with subsequent print runs being decided by reader interest. Two years and 99 issues on, the newspaper – aimed at the 48pc of people who voted to remain in the EU -now has more than 8,000 subscribers. Matt, who edits the paper, told HTFP: “There was much cynicism around when we launched the title. I hope we’ve proved those cynics wrong. “In its two-year life, The New European has sold more than two million copies at a high price point, has more than 8,000 current subscribers, and has won several major industry awards. Its contributors include editor-at-large Alistair Campbell, the former No 10 communications director, who asked to get involved in the project to help stop Brexit. Fair play, here we’ve got a success story in the wilderness of pain that is newspaper journalism these days. De Brulay (not to be confused with Belgian ace Kevin de Bruyne) acknowledges the efforts of all involved with a Roman emperor’s thumbs up. Right Mr Kelly, you’ve made a success story of this, but now it’s time to take a step back and give some time and attention to Archant’s other printed products – some of which are really struggling. ‘ some’ of which are really struggling? Have you seen the latest ABCs? Priorities aren’t with the print portfolio (except the NE of course) obviously as ALL are in free fall and falling further with each passing month. There must be a point at which the company bean counters say enough’s enough and invest or pull the plug on the worst performers surely. @ Archie – I was being diplomatic to ensure publication of my comment! The trouble with TNE is that if it operated to company standards, the likes of Rachel Johnson and Yasmin Alibhai-Brown aren’t going to accept EDP columnist rates – yet which publication’s success is more crucial to Archant’s finances? Credit is due for launching a paper which targets a specific group and is successful. It isn’t a complicated recipe, but it works.Hopefully that continues. However, as said by others, what about the rest of Archant’s papers? TNE looks different each week as it is designed properly – how about showing the other titles the same affection? SeasideJourno is spot on – The New European would be very different if it used other Archant titles’ dull templates, was limited to the three story lengths imposed by the senior ‘content’ management, or had most of its articles put online before the paper ever hit any news stand. It was the 15% shared content in all of Archant’s magazines wot funded it….